Location of Slocum Massacre. Courtesy of Robert Calzada and the Austin American-Statesman. Image available on the Internet and included in accordance with Title 17 U.S.C. Section 107. SLOCUM MASSACRE. The Slocum Massacre occurred on July 29, 1910, near the small town of Slocum twelve miles southeast of Palestine in Anderson County. Beginning in the morning of the 29th, white residents of the rural area shot and killed eight unarmed African-American men. The victims, who lived in the same rural neighborhood as their killers, ranged in age from eighteen to seventy. Two others were wounded but survived. Many reasons for the violence have been suggested—ranging from a white man’s anger at being told to work with an African American who was placed in charge of a local public road, to a plot by whites to take land from blacks, to a dispute over an unpaid loan—however, no reason has been clearly established. Slocum Massacre in a Houston newspaper. Image available on the Internet and included in accordance with Title 17 U.S.C. Section 107. State and national newspapers quickly printed accounts of the violence near Slocum and often exaggerated the numbers of whites in the mob and the numbers of blacks killed. Anderson County Sheriff William H. Black was quoted as saying: “There was just a hot-headed gang hunting them down and killing them.…They were just hunting the negroes down like sheep.” Governor Thomas Campbell responded by sending Texas Rangers and state militia into the area to restore order. Eleven local whites soon were arrested, and District Judge Benjamin H. Gardner empanelled a grand jury within a week. On August 17, the grand jury indicted seven men for murder. Their cases were moved to Harris County on a change of venue but eventually were dropped without being prosecuted. Five of the indicted men remained in jail until May 1911 because Judge Gardner denied them bail until he was ordered to act by the Texas Court of Criminal Appeals. 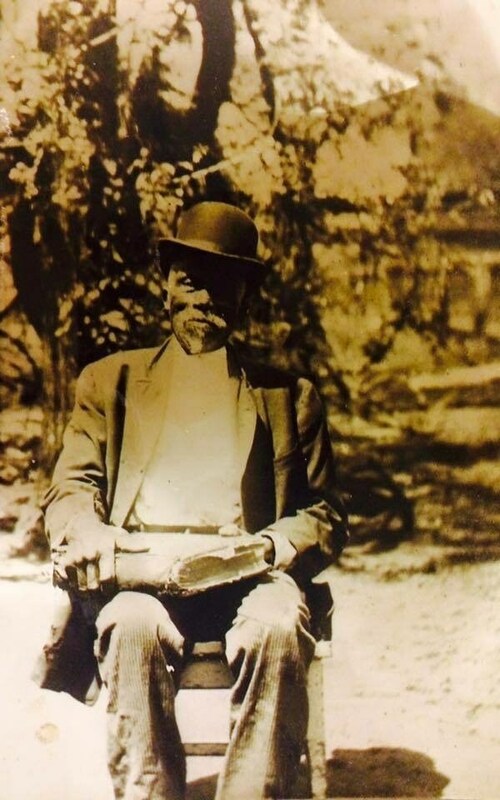 Jack Hollie, survivor of the Slocum Massacre. Image available on the Internet and included in accordance with Title 17 U.S.C. Section 107. In the aftermath of the massacre, some African Americans left Anderson County and never returned. Sixteen-year-old Wilustus “Lusk” Holley (often spelled Hollie or Holly), for example, having seen the murder of his older brother Alex and escaping with his own life only by playing dead after being shot, moved to Fort Worth. Others, however, including Reagan and Marshall Holley, older brothers of Alex and “Lusk,” lived out their lives in Anderson County. Overall, the African-American population in the Slocum area, while not matching the rate of growth for whites, increased slightly between 1910 and 1920. Slocum Massacre Historical Marker. Image available on the Internet and included in accordance with Title 17 U.S.C. Section 107. 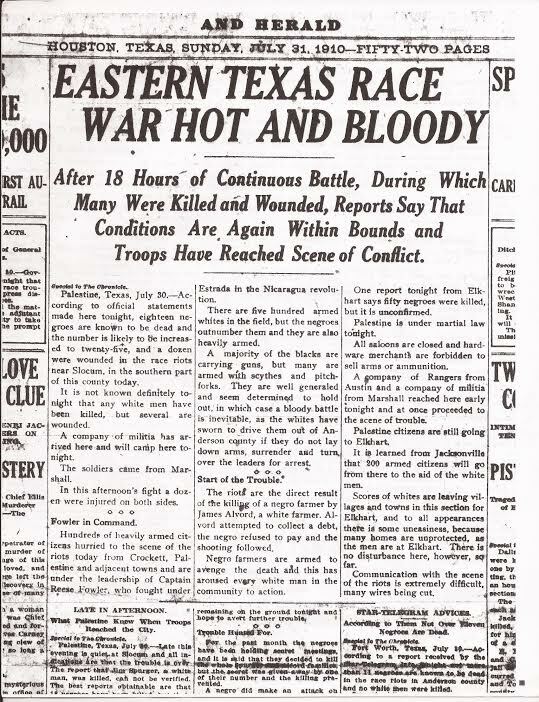 The murders of July 1910, although especially horrible, were but one event in a long train of race-based violence in East Texas during the first half of the twentieth century. Soon the story faded into a past many wanted to forget or ignore. Eventually, however, in 2011, the Eighty-second Texas Legislature adopted a resolution acknowledging the Slocum Massacre, and in 2015 the Texas Historical Commission approved the erection of a historical marker at the site. Dallas Morning News, July 31, 1910; August 1, 2, 5, 18, 22, 1910; December 15, 1910; February 23, 1911; May 12, 1911. Historical Marker Files, Texas Historical Commission, Austin. House Resolution No. 865, Acknowledging the Slocum massacre of 1910 (http://www.legis.state.tx.us/tlodocs/82R/billtext/html/HR00865F.htm), accessed April 15, 2015. Handbook of Texas Online, Randolph B. Campbell, "SLOCUM MASSACRE," accessed April 26, 2019, http://www.tshaonline.org/handbook/online/articles/jcs08. Uploaded on April 16, 2015. Modified on March 28, 2016. Published by the Texas State Historical Association.